Ensure accuracy when prescribing, dispensing, and administering Oxycodone Hydrochloride Oral Solution. Dosing errors due to confusion between mg and mL, and other oxycodone hydrochloride oral solutions of different concentrations can result in accidental overdose and death [see Dosage and Administration (2.1), Warnings and Precautions (5.1)]. Oxycodone Hydrochloride Oral Solution exposes patients and other users to the risks of opioid addiction, abuse, and misuse, which can lead to overdose and death. Assess each patient’s risk prior to prescribing Oxycodone Hydrochloride Oral Solution, and monitor all patients regularly for the development of these behaviors and conditions [see Warnings and Precautions (5.2)]. Serious, life-threatening, or fatal respiratory depression may occur with use of Oxycodone Hydrochloride Oral Solution. Monitor for respiratory depression, especially during initiation of Oxycodone Hydrochloride Oral Solution or following a dose increase [see Warnings and Precautions (5.4)]. Accidental ingestion (or exposure) of even one dose of Oxycodone Hydrochloride Oral Solution, especially by children, can result in a fatal overdose of oxycodone [see Warnings and Precautions (5.4)]. Prolonged use of Oxycodone Hydrochloride Oral Solution during pregnancy can result in neonatal opioid withdrawal syndrome, which may be life-threatening if not recognized and treated, and requires management according to protocols developed by neonatology experts. If opioid use is required for a prolonged period in a pregnant woman, advise the patient of the risk of neonatal opioid withdrawal syndrome and ensure that appropriate treatment will be available [see Warnings and Precautions (5.5)]. The concomitant use of Oxycodone Hydrochloride Oral Solution with all cytochrome P450 3A4 inhibitors may result in an increase in oxycodone plasma concentrations, which could increase or prolong adverse reactions and may cause potentially fatal respiratory depression. In addition, discontinuation of a concomitantly used cytochrome P450 3A4 inducer may result in an increase in oxycodone plasma concentration. Monitor patients receiving Oxycodone Hydrochloride Oral Solution and any CYP3A4 inhibitor or inducer [see Warnings and Precautions (5.6), Drug Interactions (7), Clinical Pharmacology (12.3)]. ReserveconcomitantprescribingofOxycodoneHydrochlorideOralSolutionand benzodiazepines or other CNS depressants for use in patients for whom alternativetreatmentoptionsareinadequate. Followpatientsforsignsandsymptomsof respiratory depression and sedation. These highlights do not include all the information needed to use Oxycodone Hydrochloride Oral Solution safely and effectively. See full prescribing information for Oxycodone Hydrochloride Oral Solution. Oxycodone Hydrochloride Oral Solution is indicated for the management of pain severe enough to require an opioid analgesic and for which alternative treatments are inadequate. Ensure accuracy when prescribing, dispensing, and administering Oxycodone Hydrochloride Oral Solution to avoid dosing errors due to confusion between mg and mL, and with other oxycodone hydrochloride solutions of different concentrations, which could result in accidental overdose and death. Ensure the proper dose is communicated and dispensed. When writing prescriptions, include both the total dose in mg and the total dose in volume. Always use the enclosed calibrated measuring cup when administering Oxycodone Hydrochloride Oral Solution 5 mg/5 mL (1 mg/mL), to ensure that the dose is measured and administered accurately. Do not use household teaspoons or tablespoons to measure Oxycodone Hydrochloride Oral Solution, as using a tablespoon instead of a teaspoon could lead to overdosage. Initiate the dosing regimen for each patient individually, taking into account the patient's severity of pain, patient response, prior analgesic treatment experience, and risk factors for addiction, abuse, and misuse [see Warnings and Precautions (5.2)]. Monitor patients closely for respiratory depression, especially within the first 24-72 hours of initiating therapy and following dosage increases with oxycodone hydrochloride solution and adjust the dosage accordingly [see Warnings and Precautions (5.4)]. Initiate treatment with Oxycodone Hydrochloride Oral Solution: 5 to 15 mg every 4 to 6 hours as needed for pain. For control of severe chronic pain, Oxycodone Hydrochloride Oral Solution should be administered on a regularly scheduled basis, every 4 to 6 hours, at the lowest dosage level that will achieve adequate analgesia. risk factors for abuse, addiction or diversion, including a prior history of abuse, addictionor diversion. The following dosing recommendations, therefore, can only be considered as suggested approaches to what is actually a series of clinical decisions over time in the management of the pain of each individual patient. Continual re-evaluation of the patient receiving oxycodone hydrochloride is important, with special attention to the maintenance of pain management and the relative incidence of side effects associated with therapy. During chronic therapy, especially for non-cancer-related pain, periodically re-assess the continued need for the use of opioid analgesics. There is inter-patient variability in the potency of opioid drugs and opioid formulations. Therefore, a conservative approach is advised when determining the total daily dosage of Oxycodone Hydrochloride Oral Solution. It is safer to underestimate a patient’s 24-hour Oxycodone Hydrochloride Oral Solution than to overestimate the 24-hour Oxycodone Hydrochloride Oral Solution dosage and manage an adverse reaction due to overdose. In converting patients from other opioids to Oxycodone Hydrochloride Oral Solution, close observation and adjustment of dosage based upon the patient’s response to Oxycodone Hydrochloride Oral Solution is imperative. Physicians and other healthcare professionals are advised to refer to published relative potency information, keeping in mind that conversion ratios are only approximate. The relative bioavailability of Oxycodone Hydrochloride Oral Solution compounds to extended- release oxycodone is unknown, so conversion to extended-release tablets/capsules must be accompanied by close observation for signs of excessive sedation and respiratory depression. Individually titrate Oxycodone Hydrochloride Oral Solution to a dose that provides adequate analgesia and minimizes adverse reactions. Continually reevaluate patients receiving Oxycodone Hydrochloride Oral Solution to assess the maintenance of pain control and the relative incidence of adverse reactions, as well as monitoring for the development of addiction, abuse, or misuse [see Warnings and Precautions (5.2)]. Frequent communication is important among the prescriber, other members of the healthcare team, the patient, and the caregiver/family during periods of changing analgesic requirements, including initial titration. If the level of pain increases after dosage stabilization, attempt to identify the source of increased pain before increasing the Oxycodone Hydrochloride Oral Solution dosage. If unacceptable opioid-related adverse reactions are observed, consider reducing the dosage. Adjust the dosage to obtain an appropriate balance between management of pain and opioid-related adverse reactions. When a patient who has been taking Oxycodone Hydrochloride Oral Solution regularly and may be physically dependent no longer requires therapy with cocaine hydrochloride oral solution, taper the dose gradually, by 25% to 50% every 2 to 4 days, while monitoring carefully for signs and symptoms of withdrawal. If the patient develops these signs or symptoms, raise the dose to the previous level and taper more slowly, either by increasing the interval between decreases, decreasing the amount of change in dose, or both. Do not abruptly discontinue Oxycodone Hydrochloride Oral Solution in a physically-dependent patient [see Warnings and Precautions (5.14), Drug Abuse and Dependence (9.3)]. Dosing errors can result in accidental overdose and death. Avoid dosing errors that may result from confusion between mg and mL and confusion with oxycodone solutions of different concentrations, when prescribing, dispensing, and administering Oxycodone Hydrochloride Oral Solution. Ensure that the dose is communicated clearly and dispensed accurately. Always use the enclosed calibrated measuring cup when administering Oxycodone Hydrochloride Oral Solution to ensure the dose is measured and administered accurately. Do not use a teaspoon or a tablespoon to measure a dose. A household teaspoon or tablespoon is not an adequate measuring device. Given the inexactitude of the household spoon measure and the possibility of using a tablespoon instead of a teaspoon, which could lead to overdosage, it is strongly recommended that, if the enclosed calibrated measuring cup becomes lost, caregivers obtain and use a calibrated measuring device. Health care providers should recommend a calibrated device that can measure and deliver the prescribed dose accurately, and instruct caregivers to use extreme caution in measuring the dosage. Oxycodone Hydrochloride Oral Solution contains oxycodone, a Schedule II controlled substance. As an opioid, Oxycodone Hydrochloride Oral Solution exposes users to the risks of addiction, abuse, and misuse [see Drug Abuse and Dependence (9)]. Although the risk of addiction in any individual is unknown, it can occur in patients appropriately prescribed Oxycodone Hydrochloride Oral Solution. Addiction can occur at recommended dosages and if the drug is misused or abused. Assess each patient’s risk for opioid addiction, abuse, or misuse prior to prescribing Oxycodone Hydrochloride Oral Solution, and monitor all patients receiving Oxycodone Hydrochloride Oral Solution for the development of these behaviors and conditions. Risks are increased in patients with a personal or family history of substance abuse (including drug or alcohol abuse or addiction) or mental illness (e.g., major depression). The potential for these risks should not, however, prevent the proper management of pain in any given patient. Patients at increased risk may be prescribed opioids such as Oxycodone Hydrochloride Oral Solution, but use in such patients necessitates intensive counseling about the risks and proper use of Oxycodone Hydrochloride Oral Solution along with intensive monitoring for signs of addiction, abuse, and misuse. Opioids are sought by drug abusers and people with addiction disorders and are subject to criminal diversion. Consider these risks when prescribing or dispensing Oxycodone Hydrochloride Oral Solution. Strategies to reduce these risks include prescribing the drug in the smallest appropriate quantity and advising the patient on the proper disposal of unused drug [see Patient Counseling Information (17)]. Contact local state professional licensing board or state controlled substances authority for information on how to prevent and detect abuse or diversion of this product. Serious, life-threatening, or fatal respiratory depression has been reported with the use of opioids, even when used as recommended. Respiratory depression, if not immediately recognized and treated, may lead to respiratory arrest and death. Management of respiratory depression may include close observation, supportive measures, and use of opioid antagonists, depending on the patient’s clinical status [see Overdosage (10)]. Carbon dioxide (CO2) retention from opioid-induced respiratory depression can exacerbate the sedating effects of opioids. While serious, life-threatening, or fatal respiratory depression can occur at any time during the use of Oxycodone Hydrochloride Oral Solution, the risk is greatest during the initiation of therapy or following a dosage increase. Monitor patients closely for respiratory depression, especially within the first 24-72 hours of initiating therapy with and following dosage increases of Oxycodone Hydrochloride Oral Solution. To reduce the risk of respiratory depression, proper dosing and titration of Oxycodone Hydrochloride Oral Solution are essential [see Dosage and Administration (2)]. Overestimating the Oxycodone Hydrochloride Oral Solution dosage when converting patients from another opioid product can result in a fatal overdose with the first dose. Accidental ingestion of even one dose of Oxycodone Hydrochloride Oral Solution, especially by (in) children, can result in respiratory depression and death due to an overdose of oxycodone. Prolonged use of Oxycodone Hydrochloride Oral Solution during pregnancy can result in withdrawal in the neonate. Neonatal opioid withdrawal syndrome, unlike opioid withdrawal syndrome in adults, may be life-threatening if not recognized and treated, and requires management according to protocols developed by neonatology experts. Observe newborns for signs of neonatal opioid withdrawal syndrome and manage accordingly. Advise pregnant women using opioids for a prolonged period of the risk of neonatal opioid withdrawal syndrome and ensure that appropriate treatment will be available [see Use in Specific Populations (8.1), Patient Counseling Information (17)]. Concomitant use of Oxycodone Hydrochloride Oral Solution with a CYP3A4 inhibitor, such as macrolide antibiotics (e.g., erythromycin), azole-antifungal agents (e.g., ketoconazole), and protease inhibitors (e.g., ritonavir), may increase plasma concentrations of oxycodone and prolong opioid adverse reactions, which may cause potentially fatal respiratory depression [see Warnings and Precautions (5.4)], particularly when an inhibitor is added after a stable dose of Oxycodone Hydrochloride Oral Solution is achieved. Similarly, discontinuation of a CYP3A4 inducer, such as rifampin, carbamazepine, and phenytoin, in Oxycodone Hydrochloride Oral Solution-treated patients may increase oxycodone plasma concentrations and prolong opioid adverse reactions. When using Oxycodone Hydrochloride Oral Solution with CYP3A4 inhibitors or discontinuing CYP3A4 inducers in Oxycodone Hydrochloride Oral Solution-treated patients, monitor patients closely at frequent intervals and consider dosage reduction of Oxycodone Hydrochloride Oral Solution until stable drug effects are achieved [see Dosage and Administration (2.1), Drug Interactions (7)]. Concomitant use of Oxycodone Hydrochloride Oral Solution with CYP3A4 inducers or discontinuation of an CYP3A4 inhibitor could decrease oxycodone plasma concentrations, decrease opioid efficacy or, possibly, lead to a withdrawal syndrome in a patient who had developed physical dependence to oxycodone. When using Oxycodone Hydrochloride Oral Solution with CYP3A4 inducers or discontinuing CYP3A4 inhibitors, monitor patients closely at frequent intervals and consider increasing the opioid dosage if needed to maintain adequate analgesia or if symptoms of opioid withdrawal occur [see Dosage and Administration (2.1), Drug Interactions (7)]. Profound sedation, respiratory depression, coma, and death may result from the concomitant use of Oxycodone Hydrochloride Oral Solution with benzodiazepines or other CNS depressants (e.g., non-benzodiazepine sedatives/hypnotics, anxiolytics, tranquilizers, muscle relaxants, general anesthetics, antipsychotics, other opioids, alcohol). Because of these risks, reserve concomitant prescribing of these drugs for use in patients for whom alternative treatment options are inadequate. Advise both patients and caregivers about the risks of respiratory depression and sedation when Oxycodone Hydrochloride Oral Solution is used with benzodiazepines or other CNS depressants (including alcohol and illicit drugs). Advise patients not to drive or operate heavy machinery until the effects of concomitant use of the benzodiazepine or other CNS depressant have been determined. Screen patients for risk of substance use disorders, including opioid abuse and misuse, and warn them of the risk for overdose and death associated with the use of additional CNS depressants including alcohol and illicit drugs [see Drug Interactions (7)and Patient Counseling Information (17)]. The use of Oxycodone Hydrochloride Oral Solution in patients with acute or severe bronchial asthma in an unmonitored setting or in the absence of resuscitative equipment is contraindicated. Patients with Chronic Pulmonary Disease: Oxycodone Hydrochloride Oral Solution-treated patients with significant chronic obstructive pulmonary disease or cor pulmonale, and those with a substantially decreased respiratory reserve, hypoxia, hypercapnia, or pre-existing respiratory depression are at increased risk of decreased respiratory drive including apnea, even at recommended dosages of Oxycodone Hydrochloride Oral Solution [see Warnings and Precautions (5.4)]. Elderly, Cachetic, or Debilitated Patients: Life-threatening respiratory depression is more likely to occur in elderly, cachectic, or debilitated patients because they may have altered pharmacokinetics or altered clearance compared to younger, healthier patients [see Warnings and Precautions (5.4)]. Monitor such patients closely, particularly when initiating and titrating Oxycodone Hydrochloride Oral Solution and when Oxycodone Hydrochloride Oral Solution is given concomitantly with other drugs that depress respiration [see Warnings and Precautions (5.4)]. Alternatively, consider the use of non-opioid analgesics in these patients. Oxycodone Hydrochloride Oral Solution may cause severe hypotension including orthostatic hypotension and syncope in ambulatory patients. There is increased risk in patients whose ability to maintain blood pressure has already been compromised by a reduced blood volume or concurrent administration of certain CNS depressant drugs (e.g. phenothiazines or general anesthetics) [see Drug Interactions (7)]. Monitor these patients for signs of hypotension after initiating or titrating the dosage of Oxycodone Hydrochloride Oral Solution. In patients with circulatory shock, Oxycodone Hydrochloride Oral Solution may cause vasodilation that can further reduce cardiac output and blood pressure. Avoid the use of Oxycodone Hydrochloride Oral Solution in patients with circulatory shock. In patients who may be susceptible to the intracranial effects of CO2 retention (e.g., those with evidence of increased intracranial pressure or brain tumors), Oxycodone Hydrochloride Oral Solution may reduce respiratory drive, and the resultant CO2 retention can further increase intracranial pressure. Monitor such patients for signs of sedation and respiratory depression, particularly when initiating therapy with Oxycodone Hydrochloride Oral Solution. Opioids may also obscure the clinical course in a patient with a head injury. Avoid the use of Oxycodone Hydrochloride Oral Solution in patients with impaired consciousness or coma. Oxycodone Hydrochloride Oral Solution is contraindicated in patients with known or suspected gastrointestinal obstruction, including paralytic ileus. The oxycodone in Oxycodone Hydrochloride Oral Solution may cause spasm of the sphincter of Oddi. Opioids may cause increases in serum amylase. Monitor patients with biliary tract disease, including acute pancreatitis for worsening symptoms. The oxycodone in Oxycodone Hydrochloride Oral Solution may increase the frequency of seizures in patients with seizure disorders, and may increase the risk of seizures occurring in other clinical settings associated with seizures. Monitor patients with a history of seizure disorders for worsened seizure control during Oxycodone Hydrochloride Oral Solution therapy. Avoid the use of mixed agonist/antagonist (e.g., pentazocine, nalbuphine, and butorphanol) or partial agonist (e.g., buprenorphine) analgesics in patients who are receiving a full opioid agonist analgesic, including Oxycodone Hydrochloride Oral Solution. In these patients, mixed agonist/antagonist and partial agonist analgesics may reduce the analgesic effect and/or precipitate withdrawal symptoms [see Drug Interactions (7)]. When discontinuing Oxycodone Hydrochloride Oral Solution in a physically-dependent patient, gradually taper the dosage [see Dosage and Administration (2.1)]. Do not abruptly discontinue Oxycodone Hydrochloride Oral Solution in these patients [see Drug Abuse and Dependence (9.3)]. Oxycodone Hydrochloride Oral Solution may impair the mental or physical abilities needed to perform potentially hazardous activities such as driving a car or operating machinery. Warn patients not to drive or operate dangerous machinery unless they are tolerant to the effects of Oxycodone Hydrochloride Oral Solution and know how they will react to the medication [see Patient Counseling Information (17)]. The following adverse reactions associated with the use of oxycodone were identified in clinical studies or postmarketing reports. Because some of these reactions were reported voluntarily from a population of uncertain size, it is not always possible to reliably estimate their frequency or establish a causal relationship to drug exposure. Serious adverse reactions associated with oxycodone use included: respiratory depression, respiratory arrest, circulatory depression, cardiac arrest, hypotension, and/or shock. The common adverse reactions seen on initiation of therapy with oxycodone are dose-related and are typical opioid-related adverse reactions. The most frequent adverse events include nausea, constipation, vomiting, headache, and pruritus. The frequency of these reactions depended on several factors, including clinical setting, the patient’s level of opioid tolerance, and host factors specific to the individual. In all patients for whom dosing information was available (n = 191) from the open-label and double-blind studies involving another formulation of immediate-release oxycodone, the following adverse events were recorded in oxycodone treated patients with an incidence ≥ 3%. In descending order of frequency they were: nausea, constipation, vomiting, headache, pruritus, insomnia, dizziness, asthenia, and somnolence. Body as a Whole: abdominal pain, accidental injury, allergic reaction, back pain, chills and fever, fever, flu syndrome, infection, neck pain, pain, photosensitivity reaction, and sepsis. Cardiovascular: deep thrombophlebitis, heart failure, hemorrhage, hypotension, migraine, palpitation, and tachycardia. Digestive: anorexia, diarrhea, dyspepsia, dysphagia, gingivitis, glossitis, and nausea and vomiting. Metabolic and Nutritional: edema, gout, hyperglycemia, iron deficiency anemia and peripheral edema. Musculoskeletal: arthralgia, arthritis, bone pain, myalgia and pathological fracture. Nervous: agitation, anxiety, confusion, dry mouth, hypertonia, hypesthesia, nervousness, neuralgia, personality disorder, tremor, and vasodilation. Respiratory: bronchitis, cough increased, dyspnea, epistaxis, laryngismus, lung disorder, pharyngitis, rhinitis, and sinusitis. Skin and Appendages: herpes simplex, rash, sweating, and urticaria. Special Senses: amblyopia. Anaphylaxis: Anaphylaxis has been reported with ingredients contained in Oxycodone Hydrochloride Oral Solution. Table 1 includes clinically significant drug interactions with Oxycodone Hydrochloride Oral Solution. The concomitant use of Oxycodone Hydrochloride Oral Solution and CYP3A4 inhibitors can increase the plasma concentration of oxycodone, resulting in increased or prolonged opioid effects. These effects could be more pronounced with concomitant use of Oxycodone Hydrochloride Oral Solution and CYP2D6 and CYP3A4 inhibitors, particularly when an inhibitor is added after a stable dose of Oxycodone Hydrochloride Oral Solution is achieved [seeWarnings and Precautions (5.6)]. If concomitant use is necessary, consider dosage reduction of Oxycodone Hydrochloride Oral Solution until stable drug effects are achieved. Monitor patients for respiratory depression and sedation at frequent intervals. If a CYP3A4 inhibitor is discontinued, consider increasing the Oxycodone Hydrochloride Oral Solution dosage until stable drug effects are achieved [see Dosage and Administration (2.2)]. Monitor for signs of opioid withdrawal. The concomitant use of Oxycodone Hydrochloride Oral Solution and CYP3A4 inducers can decrease the plasma concentration of oxycodone [see Clinical Pharmacology (12.3)], resulting in decreased efficacy or onset of a withdrawal syndrome in patients who have developed physical dependence to oxycodone [see Warnings and Precautions (5.6)]. If concomitant use is necessary, consider increasing the Oxycodone Hydrochloride Oral Solution dosage until stable drug effects are achieved. Monitor for signs of opioid withdrawal. If a CYP3A4 inducer is discontinued, consider Oxycodone Hydrochloride Oral Solution dosage reduction and monitor for signs of respiratory depression. Reserve concomitant prescribing of these drugs for use in patients for whom alternative treatment options are inadequate. Limit dosages and durations to the minimum required. Follow patients closely for signs of respiratory depression and sedation [ see Warnings and Precautions (5.7)]. If concomitant use is warranted, carefully observe the patient, particularly during treatment initiation and dose adjustment. Discontinue Oxycodone Hydrochloride Oral Solution if serotonin syndrome is suspected. MAOI interactions with opioids may manifest as serotonin syndrome or opioid toxicity (e.g., respiratory depression, coma) [see Warnings and Precautions (5.4)]. The use of Oxycodone Hydrochloride Oral Solution is not recommended for patients taking MAOIs or within 14 days of stopping such treatment. May reduce the analgesic effect of Oxycodone Hydrochloride Oral Solution and/or precipitate withdrawal symptoms. Monitor patients for signs of respiratory depression that may be greater than otherwise expected and decrease the dosage of Oxycodone Hydrochloride Oral Solution and/or the muscle relaxant as necessary. Monitor patients for signs of urinary retention or reduced gastric motility when Oxycodone Hydrochloride Oral Solution is used concomitantly with anticholinergic drugs. Prolonged use of opioid analgesics during pregnancy may cause neonatal opioid withdrawal syndrome [see Warnings and Precautions (5.5)]. Available data with Oxycodone Hydrochloride Oral Solution are insufficient to inform a drug-associated risk for major birth defects and miscarriage. Animal reproduction studies with oral administrations of oxycodone hydrochloride in rats and rabbits during the period of organogenesis at doses 2.6 and 8.1 times, respectively, the human dose of 60 mg/day did not reveal evidence of teratogenicity or embryo-fetal toxicity. In several published studies, treatment of pregnant rats with oxycodone at clinically relevant doses and below, resulted in neurobehavioral effects in offspring [see Data]. Based on animal data, advise pregnant women of the potential risk to a fetus. The background risk of major birth defects and miscarriage for the indicated population is unknown. All pregnancies have a background risk of birth defect, loss, or other adverse outcomes. In the U.S. general population, the estimated background risk of major birth defects and miscarriage in clinically recognized pregnancies is 2-4% and 15-20%, respectively. Neonatal opioid withdrawal syndrome presents as irritability, hyperactivity and abnormal sleep pattern, high pitched cry, tremor, vomiting, diarrhea, and failure to gain weight. The onset, duration, and severity of neonatal opioid withdrawal syndrome vary based on the specific opioid used, duration of use, timing and amount of last maternal use, and rate of elimination of the drug by the newborn. Observe newborns for symptoms of neonatal opioid withdrawal syndrome and manage accordingly [see Warnings and Precautions (5.5)]. Opioids cross the placenta and may produce respiratory depression and psycho-physiologic effects in neonates. An opioid antagonist, such as naloxone, must be available for reversal of opioid-induced respiratory depression in the neonate. Oxycodone Hydrochloride Oral Solution is not recommended for use in pregnant women during or immediately prior to labor, when other analgesic techniques are more appropriate. Opioid analgesics, including Oxycodone Hydrochloride Oral Solution, can prolong labor through actions which temporarily reduce the strength, duration, and frequency of uterine contractions. However, this effect is not consistent and may be offset by an increased rate of cervical dilation, which tends to shorten labor. Monitor neonates exposed to opioid analgesics during labor for signs of excess sedation and respiratory depression. In embryo-fetal development studies in rats and rabbits, pregnant animals received oral doses of oxycodone hydrochloride administered during the period of organogenesis up to 16 mg/kg/day and up 25 mg/kg/day, respectively. These studies revealed no evidence of teratogenicity or embryo-fetal toxicity due to oxycodone. The highest doses tested in rats and rabbits were equivalent to approximately 2.6 and 8.1 times an adult human dose of 60 mg/day, respectively, on a mg/m2 basis. In published studies, offspring of pregnant rats administered oxycodone during gestation have been reported to exhibit neurobehavioral effects including altered stress responses, increased anxiety-like behavior (2 mg/kg/day IV from Gestation Day 8 to 21 and Postnatal Day 1, 3, and 5; 0.3-times an adult human dose of 60 mg/day, on a mg/m2 basis) and altered learning and memory (15 mg/kg/day orally from breeding through parturition; 2.4 times an adult human dose of 60 mg/day, on a mg/m2 basis). Oxycodone is present in breast milk. Published lactation studies report variable concentrations of oxycodone in breast milk with administration of immediate-release oxycodone to nursing mothers in the early postpartum period. The lactation studies did not assess breastfed infants for potential adverse reactions. Lactation studies have not been conducted with Oxycodone Hydrochloride Oral Solution, and no information is available on the effects of the drug on the breastfed infant or the effects of the drug on milk production. The developmental and health benefits of breastfeeding should be considered along with the mother’s clinical need for Oxycodone Hydrochloride Oral Solution and any potential adverse effects on the breastfed infant from Oxycodone Hydrochloride Oral Solution or from the underlying maternal condition. Monitor infants exposed to Oxycodone Hydrochloride Oral Solution through breast milk for excess sedation and respiratory depression. Withdrawal symptoms can occur in breastfed infants when maternal administration of an opioid analgesic is stopped, or when breast-feeding is stopped. Chronic use of opioids may cause reduced fertility in females and males of reproductive potential. It is not known whether these effects on fertility are reversible [see Adverse Reactions (6), Clinical Pharmacology (12.2)]. The safety and efficacy of Oxycodone Hydrochloride Oral Solution in pediatric patients below the age of 18 have not been established. Elderly patients (aged 65 years or older) may have increased sensitivity to oxycodone. In general, use caution when selecting a dose for an elderly patient, usually starting at the low end of the dosing range, reflecting the greater frequency of decreased hepatic, renal, or cardiac function and of concomitant disease or other drug therapy. Respiratory depression is the chief risk for elderly patients treated with opioids, and has occurred after large initial doses were administered to patients who were not opioid-tolerant or when opioids were co-administered with other agents that depress respiration. Titrate the dosage of Oxycodone Hydrochloride Oral Solution slowly in geriatric patients and monitor closely for signs of central nervous system and respiratory depression [see Warnings and Precautions (5.7)]. Since oxycodone is extensively metabolized in the liver, its clearance may decrease in patients with hepatic impairment. Initiate therapy in these patients with a lower than usual dosage of Oxycodone Hydrochloride Oral Solution and titrate carefully. Monitor closely for adverse events such as respiratory depression, sedation, and hypotension [see Clinical Pharmacology (12.3)]. Information from oxycodone tablets indicate that patients with renal impairment had higher plasma concentrations of oxycodone than subjects with normal renal function. Initiate therapy with a lower than usual dosage of Oxycodone Hydrochloride Oral Solution and titrate carefully. Monitor closely for adverse events such as respiratory depression, sedation, and hypotension [see Clinical Pharmacology (12.3)]. Oxycodone Hydrochloride Oral Solution contains oxycodone, a Schedule II controlled substance. 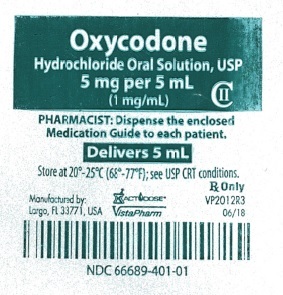 Oxycodone Hydrochloride Oral Solution contains oxycodone, a substance with a high potential for abuse similar to other opioids including fentanyl, hydrocodone, hydromorphone, methadone, morphine, oxymorphone, and tapentadol. Oxycodone Hydrochloride Oral Solution can be abused and is subject to misuse, addiction, and criminal diversion [see Warnings and Precautions (5.2)]. Oxycodone Hydrochloride Oral Solution, like other opioids, can be diverted for non-medical use into illicit channels of distribution. Careful record-keeping of prescribing information, including quantity, frequency, and renewal requests, as required by state and federal law, is strongly advised. Oxycodone Hydrochloride Oral Solution is for oral use only. Abuse of oxycodone poses a risk of overdose and death. The risk is increased with concurrent abuse of alcohol and other central nervous system depressants. Parenteral drug abuse is commonly associated with transmission of infectious diseases such as hepatitis and HIV. Oxycodone Hydrochloride Oral Solution should not be abruptly discontinued in a physically- dependent patient [see Dosage and Administration (2.4)]. If Oxycodone Hydrochloride Oral Solution is abruptly discontinued in a physically-dependent patient, a withdrawal syndrome may occur. Some or all of the following can characterize this syndrome: restlessness, lacrimation, rhinorrhea, yawning, perspiration, chills, myalgia, and mydriasis. Other signs and symptoms also may develop, including: irritability, anxiety, backache, joint pain, weakness, abdominal cramps, insomnia, nausea, anorexia, vomiting, diarrhea, or increased blood pressure, respiratory rate, or heart rate. Infants born to mothers physically dependent on opioids will also be physically dependent and may exhibit respiratory difficulties and withdrawal signs [see Use in Specific Populations (8.1)]. Acute overdose with Oxycodone Hydrochloride Oral Solution can be manifested by respiratory depression, somnolence progressing to stupor or coma, skeletal muscle flaccidity, cold and clammy skin, constricted pupils, and, in some cases, pulmonary edema, bradycardia, hypotension, partial or complete airway obstruction, atypical snoring, and death. Marked mydriasis rather than miosis may be seen with hypoxia in overdose situations [see Clinical Pharmacology (12.2)]. Because the duration of opioid reversal is expected to be less than the duration of action of oxycodone in Oxycodone Hydrochloride Oral Solution, carefully monitor the patient until spontaneous respiration is reliably re-established. If the response to an opioid antagonist is suboptimal or only brief in nature, administer additional antagonist as directed by the product’s prescribing information. Oxycodone Hydrochloride Oral Solution is an opioid agonist, available as solution in 5 mg/5 mL (1 mg/mL) strength for oral administration. Oxycodone Hydrochloride Oral Solution, 5 mg per 5 mL contains equivalent of 4.5 mg of oxycodone free base per 5 mL's and contains the following inactive ingredients: Poloxamer 188 NF, Sodium Benzoate NF, Citric Acid Anhydrous USP, Glycerin Natural USP, Sorbitol Solution 70% USP, FD&C Red #40, Raspberry Flavor and Water. Oxycodone is a full opioid agonist and is relatively selective for the mu-opioid receptor, although it can bind to other opioid receptors at higher doses. The principal therapeutic action of oxycodone is analgesia. Like all full opioid agonists, there is no ceiling effect for analgesia with oxycodone. Clinically, dosage is titrated to provide adequate analgesia and may be limited by adverse reactions, including respiratory and CNS depression. Oxycodone produces respiratory depression by direct action on brain stem respiratory centers. The respiratory depression involves a reduction in the responsiveness of the brain stem respiratory centers to both increases in carbon dioxide tension and to electrical stimulation. Oxycodone causes a reduction in motility associated with an increase in smooth muscle tone in the antrum of the stomach and duodenum. Digestion of food in the small intestine is delayed and propulsive contractions are decreased. Propulsive peristaltic waves in the colon are decreased, while tone may be increased to the point of spasm resulting in constipation. Other opioid- induced effects may include a reduction in biliary and pancreatic secretions, spasm of sphincter of Oddi, and transient elevations in serum amylase. The minimum effective analgesic concentration will vary widely among patients, especially among patients who have been previously treated with potent agonist opioids. The minimum effective analgesic concentration of oxycodone for any individual patient may increase over time due to an increase in pain, the development of a new pain syndrome and/or the development of analgesic tolerance [see Dosage and Administration (2.1, 2.2)]. There is a relationship between increasing oxycodone plasma concentration and increasing frequency of dose-related opioid adverse reactions such as nausea, vomiting, CNS effects, and respiratory depression. In opioid-tolerant patients, the situation may be altered by the development of tolerance to opioid-related adverse reactions [see Dosage and Administration (2.1, 2.2, 2.3)]. The activity of Oxycodone Hydrochloride Oral Solution is primarily due to the parent drug oxycodone. The oral bioavailability of oxycodone is 60 - 87%. This high oral bioavailability (compared to other oral opioids) is due to lower pre-systemic and/or first-pass metabolism of oxycodone. Presence of food may slightly delay the rate (Cmax and Tmax) and enhance the extent of absorption (AUC) of oxycodone from Oxycodone Hydrochloride Oral Solution. Overall, food is not expected to have a clinically significant impact on the absorption of Oxycodone Hydrochloride Oral Solution. Following intravenous administration, the volume of distribution (Vss) for oxycodone was 2.6 L/kg. Plasma protein binding of oxycodone at 37°C and a pH of 7.4 was about 45%. Oxycodone has been found in breast milk [see Use in Specific Populations (8.2)]. Oxycodone hydrochloride is extensively metabolized to noroxycodone, oxymorphone, noroxymorphone, which are subsequently glucuronidated. CYP3A4 mediated N-demethylation to noroxycodone is the primary metabolic pathway of oxycodone with a less contribution from CYP2D6 mediated O-demethylation to oxymorphone. Therefore, the formation of these and related metabolites can, in theory, be affected by other drugs. 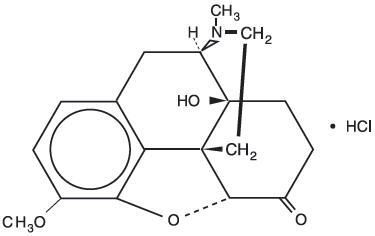 The major circulating metabolite is noroxycodone with an AUC ratio of 0.6 relative to that of oxycodone. Noroxycodone is reported to be a considerably weaker analgesic than oxycodone. Oxymorphone, although possessing analgesic activity, is present in the plasma only in low concentrations. The correlation between oxymorphone concentrations and opioid effects was much less than that seen with oxycodone plasma concentrations. The analgesic activity profile of other metabolites is not known. 0.8 L/min for adults. Apparent elimination half-life of oxycodone following the administration of Oxycodone Hydrochloride Oral Solution was approximately 3.5 hours. Information obtained from oxycodone tablets indicate that the plasma concentrations of oxycodone did not appear to be increased in patients over of the age of 65. Because oxycodone is extensively metabolized in the liver, its clearance may decrease in hepatic- impaired patients. A dose adjustment is recommended in these patients [see Use in Special Populations (8.6)]. Because this drug is known to be substantially excreted by the kidney, and the risk of adverse reactions to this drug may be greater in patients with impaired renal function, a dose reduction is recommended for renal impaired patients [see Use in Special Populations (8.7)]. CYP3A4 is the major enzyme involved in noroxycodone formation. A published study showed that the co-administration of voriconazole, a CYP3A4 inhibitor, increased oxycodone AUC and Cmax by 3.6 and 1.7 fold, respectively. A published study showed that the co-administration of rifampin, a drug metabolizing enzyme inducer, decreased oxycodone AUC and Cmax values by 86% and 63%, respectively. Oxycodone is metabolized in part to oxymorphone via the cytochrome p450 isoenzyme CYP2D6. While this pathway may be blocked by a variety of drugs (e.g., certain cardiovascular drugs and antidepressants), such blockade has not yet been shown to be of clinical significance with this agent. Oxycodone hydrochloride was genotoxic in an in vitro mouse lymphoma assay in the presence of metabolic activation. There was no evidence of genotoxic potential in an in vitro bacterial reverse mutation assay (Salmonella typhimurium and Escherichia coli) or in an assay for chromosomal aberrations (in vivo mouse bone marrow micronucleus assay). Studies in animals to evaluate the potential impact of oxycodone on fertility have not been conducted. Advise patients that oxycodone hydrochloride oral solution, is available in multiple concentrations. Inform patients about which concentration they have been prescribed. 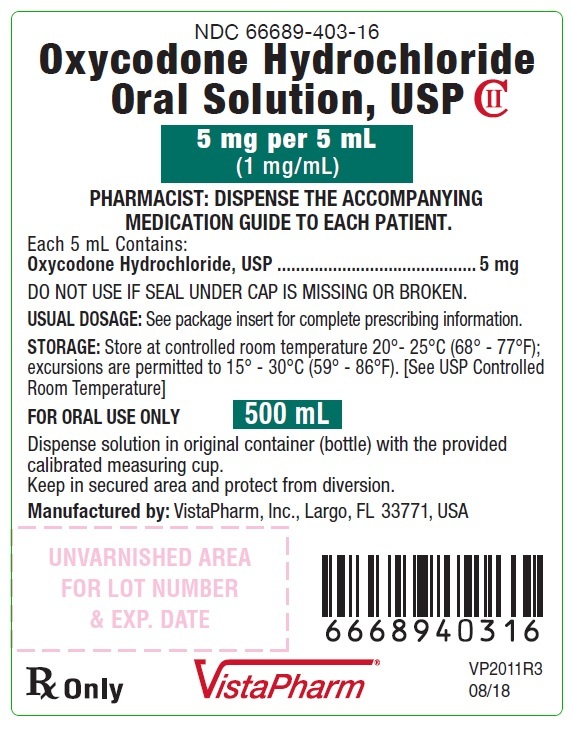 Instruct patients how to measure and take the correct dose of Oxycodone Hydrochloride Oral Solution, and to always use the enclosed cup when administering Oxycodone Hydrochloride Oral Solution to ensure the dose is measured and administered accurately [see Warnings and Precautions (5.1)]. If the prescribed concentration is changed, instruct patients on how to correctly measure the new dose to avoid errors which could result in accidental overdose and death. Inform patients that the use of Oxycodone Hydrochloride Oral Solution, even when taken as recommended, can result in addiction, abuse, and misuse, which can lead to overdose and death [see Warnings and Precautions (5.2)]. Instruct patients not to share Oxycodone Hydrochloride Oral Solution with others and to take steps to protect Oxycodone Hydrochloride Oral Solution from theft or misuse. Inform patients of the risk of life-threatening respiratory depression, including information that the risk is greatest when starting Oxycodone Hydrochloride Oral Solution or when the dosage is increased, and that it can occur even at recommended dosages [see Warnings and Precautions (5.4)]. Advise patients how to recognize respiratory depression and to seek medical attention if breathing difficulties develop. Inform patients that accidental ingestion, especially by, children, may result in respiratory depression or death [see Warnings and Precautions (5.4)]. Instruct patients to take steps to store Oxycodone Hydrochloride Oral Solution securely and to dispose of unused Oxycodone Hydrochloride Oral Solution by flushing the solution down the toilet. Inform patients and caregivers that potentially fatal additive effects may occur if Oxycodone Hydrochloride Oral Solution is used with benzodiazepines or other CNS depressants, including alcohol, and not to use these concomitantly unless supervised by a health care provider [see Warnings and Precautions (5.7), Drug Interactions (7)]. Inform patients that opioids could cause a rare but potentially life-threatening condition resulting from concomitant administration of serotonergic drugs. Warn patients of the symptoms of serotonin syndrome and to seek medical attention right away if symptoms develop. Instruct patients to inform their healthcare providers if they are taking, or plan to take serotonergic medications. [see Drug Interactions (7)]. Inform patients that opioids could cause adrenal insufficiency, a potentially life-threatening condition. Adrenal insufficiency may present with non-specific symptoms and signs such as nausea, vomiting, anorexia, fatigue, weakness, dizziness, and low blood pressure. Advise patients to seek medical attention if they experience a constellation of these symptoms [see Warnings and Precautions (5.9)]. Advise patients to always use the enclosed calibrated dosing cup when administering Oxycodone Hydrochloride Oral Solution to ensure the dose is measured and administered accurately [see Warnings and Precautions (5.1)]. Advise patients never to use household teaspoons or tablespoons to measure Oxycodone Hydrochloride Oral Solution. Advise patients not to adjust the dose of Oxycodone Hydrochloride Oral Solutionwithout consulting with a physician or other healthcare provider. If patients have been receiving treatment with Oxycodone Hydrochloride Oral Solution for more than a few weeks and cessation of therapy is indicated, counsel them on the importance of safely tapering the dose as abrupt discontinuation of the medication could precipitate withdrawal symptoms. Provide a dose schedule to accomplish a gradual discontinuation of the medication [see Dosage and Administration (2.4)]. Inform patients that Oxycodone Hydrochloride Oral Solution may cause orthostatic hypotension and syncope. Instruct patients how to recognize symptoms of low blood pressure and how to reduce the risk of serious consequences should hypotension occur (e.g., sit or lie down, carefully rise from a sitting or lying position) [see Warnings and Precautions (5.10)]. Inform patients that anaphylaxis has been reported with ingredients contained in Oxycodone Hydrochloride Oral Solution. Advise patients how to recognize such a reaction and when to seek medical attention [see Contraindications (4), Adverse Reactions (6)]. Inform female patients of reproductive potential that prolonged use of Oxycodone Hydrochloride Oral Solution during pregnancy can result in neonatal opioid withdrawal syndrome, which may be life-threatening if not recognized and treated [see Warnings and Precautions (5.5), Use in Specific Populations (8.1)]. Inform female patients of reproductive potential that Oxycodone Hydrochloride Oral Solution can (or may) cause fetal harm and to inform the healthcare provider of a known or suspected pregnancy [see Use in Specific Populations (8.1)]. Advise nursing mothers to monitor infants for increased sleepiness (more than usual), breathing difficulties, or limpness. Instruct nursing mothers to seek immediate medical care if they notice these signs [see Use in Specific Populations (8.2)]. Inform patients that Oxycodone Hydrochloride Oral Solution may impair the ability to perform potentially hazardous activities such as driving a car or operating heavy machinery. Advise patients not to perform such tasks until they know how they will react to the medication [see Warnings and Precautions (5.15)]. Advise patients to dispose of unused Oxycodone Hydrochloride Oral Solution by flushing the solution down the toilet or disposing of in accordance with local guidelines and/or regulations. To request medical information contact VistaPharm, Inc. at 1-888-655-1505. Get emergency help right away if you take too much Oxycodone Hydrochloride Oral Solution (overdose). When you first start taking Oxycodone Hydrochloride Oral Solution, when your dose is changed, or if you take too much (overdose), serious or life-threatening breathing problems that can lead to death may occur. Taking Oxycodone Hydrochloride Oral Solution with other opioid medicines, benzodiazepines, alcohol, or other central nervous system depressants (including street drugs) can cause severe drowsiness, decreased awareness, breathing problems, coma, and death. Never give anyone else your Oxycodone Hydrochloride Oral Solution. They could die from taking it. Store Oxycodone Hydrochloride Oral Solution away from children and in a safe place to prevent stealing or abuse. Selling or giving away Oxycodone Hydrochloride Oral Solution is against the law. an allergy to oxycodone or any of the ingredients in Oxycodone Hydrochloride Oral Solution. pregnant or planning to become pregnant. Prolonged use of Oxycodone Hydrochloride Oral Solution during pregnancy can cause withdrawal symptoms in your newborn baby that could be life-threatening if not recognized and treated. breastfeeding. Oxycodone Hydrochloride Oral Solution passes into breast milk and may harm your baby. taking prescription or over-the-counter medicines, vitamins, or herbal supplements. Taking Oxycodone Hydrochloride Oral Solution with certain other medicines can cause serious side effects that could lead to death. Do not change your dose. Take Oxycodone Hydrochloride Oral Solution exactly as prescribed by your healthcare provider. Use the lowest dose possible for the shortest time needed. Always use the syringe that comes with Oxycodone Hydrochloride Oral Solution to correctly measure your dose. Never use a household teaspoon or tablespoon to measure Oxycodone Hydrochloride Oral Solution. Take your prescribed dose every 4-6 hours. Do not take more than your prescribed dose. If you miss a dose, take your next dose at your usual time. If you have been taking Oxycodone Hydrochloride Oral Solution regularly, do not stop taking Oxycodone Hydrochloride Oral Solution without talking to your healthcare provider. After you stop taking Oxycodone Hydrochloride Oral Solution, flush the remaining medication down the toilet. Drive or operate heavy machinery, until you know how Oxycodone Hydrochloride Oral Solution affects you. Oxycodone Hydrochloride Oral Solution can make you sleepy, dizzy, or lightheaded. Drink alcohol or use prescription or over-the-counter medicines that contain alcohol. Using products containing alcohol during treatment with Oxycodone Hydrochloride Oral Solution may cause you to overdose and die. These are not all the possible side effects of Oxycodone Hydrochloride Oral Solution. Call your doctor for medical advice about side effects. You may report side effects to FDA at 1-800-FDA-1088.For more information, go to dailymed.nlm.nih.gov. Store at 20°-25°C (68°-77°F); see USP CRT conditions.